Would you pay a million bucks for fungus? Because that's what the world's largest truffle will probably cost you. 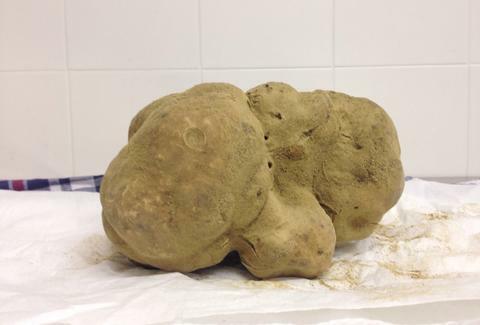 The Balestra family of Sabatino Truffles -- one of the foremost truffle suppliers in the world -- will auction off a 4.16lb, record-setting white truffle in NYC on Saturday. According to Grub Street, the bidding will start at $60,000 (but will most likely skyrocket since offers of $1 million have already rolled in from China) and proceeds will benefit Citymeals-on-Wheels and the Children's Glaucoma Foundation. The massive white beaut was discovered in central Italy this week and is nearly twice the size of the previous record holder, which weighed a measly 2.88lbs and was worth a paltry $5,080. Pete Dombrosky is an Editorial Assistant for Thrillist and since he likes truffles and wants to fight children's glaucoma, he'll be asking for a raise. If you wanna chip in, let him know on Twitter.